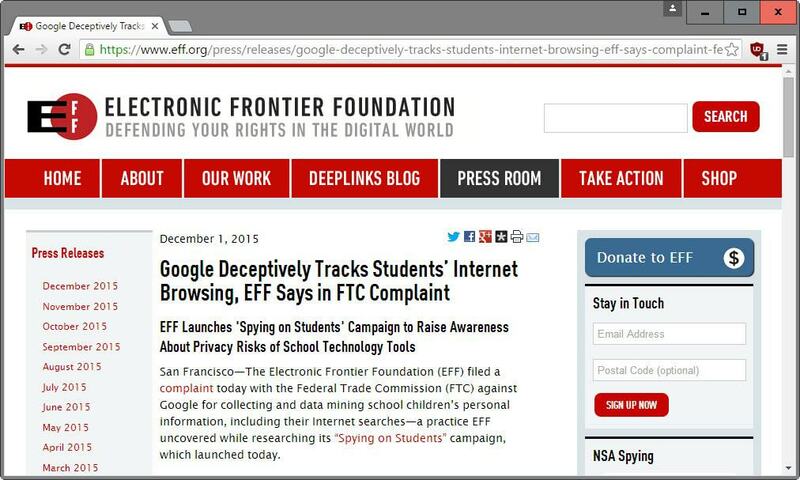 The Electronic Frontier Foundation (EFF) filed a complaint with the FCC yesterday about Google "deceptively tracking students" that participate in Google's Apps for Education program. Google Apps for Education (Gafe) is a collection of services by Google like Gmail, Calendar, Drive and Hangouts that are provided to classrooms and schools. It is very similar to Google Apps for businesses in this regard. According to Google, Google Apps for Education users don't see ads when they use Google Search and are signed in to their Apps for Education account, and services that are part of Google Apps for Education won't collect or use student data for advertising purposes or create ads profiles. Google services are separated into Google Apps for Education services, like the aforementioned Gmail or Hangouts, and Google services that are not part of the program including Maps, News and YouTube. When students use Google services that are not part of GAFE, activity is associated with their Google Apps for Education account. Google serves ads to these students on some of its services based on that activity according to the EFF. Even though Google knows that the user is using an educational account, it is tracking the user's activity on some services and feeding ads to the user based on those activities. Another issue that the EFF discovered was that Chrome Sync is enabled by default on Chromebooks used by GAFE students. This syncs the browsing history, search terms, passwords and other activity with the cloud (read Google servers). This goes against the Student Privacy Pledge that Google signed promising not to collect, use or share personal information of students except "when needed for legitimate educational purposes" or when permitted by parents. An FAQ has been created by the EFF that answers important questions about student privacy. While the underlying issues need to be addressed by Google, students may limit exposure by either signing out of their account before they use Google services that are not part of the Google Apps for Education program, or by using Chrome's private browsing mode instead for those activities. It does not seem practicable to sign out whenever a non-GAFE service is used on the device which leaves private browsing mode as the best option to deal with it as there is no option to install another browser on the device. A privacy guide for students has been released by the EFF to improve privacy on Chromebook. Now You: Are you concerned about online tracking? The Electronic Frontier Foundation filed a complaint with the FCC yesterday in which it accused Google of tracking Google Apps for Education students. LOL, people trusted Google. Smart people. Guilty once again of having been caught the fingers in the jam pot. Guilty if the EFF’s complaint leads to that confirmation. EFF is serious, but I won’t throw the stone before anything is proven. Guilty, if guilty, once again. It’s becoming a habit with Google, and the company’s concern with ethics is so arguable that innocence is perceived as either a surprise either the evidence that attorneys deserve their salary. In fact the big mistake nowadays for many leading companies as well as for any unscrupulous mind is to get caught. I’m just trying to imagine the ratio of innocence among those who don’t get caught. And they dare point their finger towards evil. Good heavens! The co-authors of the Student Privacy Pledge, The Future of Privacy Forum and The Software and Information Industry Association have both criticized EFF’s interpretation of the Pledge and their complaint. This is the company that said “Don’t be evil.” I guess they don’t take their own advice. by now it should be abundantly clear that Google tracks everyone who uses their services. It doesn’t matter if you click a little check box to tell them to stop–they still track you. Why is it a surprise?